the hand-painted stairs are installed. patience - it's not my virtue. pic i took at the junk bonanza in MN. old schoolhouse clocks = instant memories! i've been holding onto this picture since we took our trip to London last month. we ate at Giraffe in the airport and i just loved their menus and wanted to share. this restaurant is also where i discovered HP Sauce! yum-my! which i did finally find in our local grocery in the specialty foods section. p.s. thank you all for your sweet encouraging comments on our giveaway! i wish you ALL could win!!! just look at this sweetness! just look at this SWEETNESS i received in the mail from Carol in NJ!!! is she not the kindest!?! blessing me with something made by her talented hands. my heart warms every time i look at one of them. thinking about how someone who only knows me through my blog would send me something so special. thank you Carol. you've totally blessed my socks off!! save those plastic beverage bottles! my friend April has gotten me hooked on Anthropologie's window displays. these pics are from my last trip to NY. generally using run of the mill, everyday, even mundane items to create these simply amazing works of art. this time they used all sorts of plastic bottles, caps and colorful straws. thinking that this would be a fun project with the kids for some springtime decorations. i'll may have to run out and raid the recycle bin before it gets picked up! While on vacation in San Diego I was able to cross #16 off my infamous LIST! 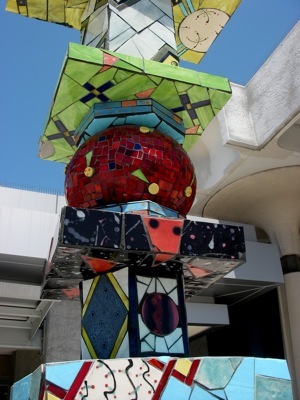 We went and visited artist Niki De Saint Phalle's Queen Califia's Magical Circle in Escondido. It's funny, but if this wasn't on my "list", as much as I wanted to see it-I don't think we would have. And. That's why I have lists! It was 99º out so we had the place to ourselves. can u imagine! This place was so unassuming, in the back of a park, in Escondido! !, down a trail that felt like it was in the middle of nowhere. Maybe that's what seemed to make it even more special. I'd love to make some sort of mosaic sculpture for my yard someday. Anyone know of a good book or resource on how to go about a project like this? This was a treat to see. And it's so much better in person. Niki De Saint Phalle was a prolific artist working in all types of mediums all over the world. Make sure to check out her website for other installations. There may be one near you! We are already finished with D.C. and almost done with Philadelphia. New York City here we come! I found this gem at the San Diego Airport right outside the United terminal. I didn't see who the artist is but it is quite amazing isn't it. I'm a sucker for mosaic anyways but add in this artists amazing use of color and to me it's a masterpiece! 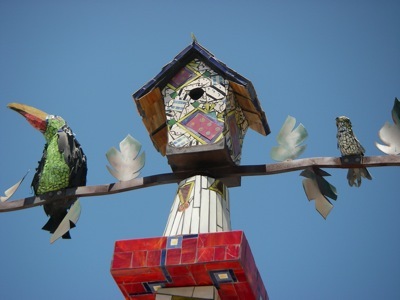 I decided to start a category featuring cool public art that I come upon. I just love stumbling across something like this. 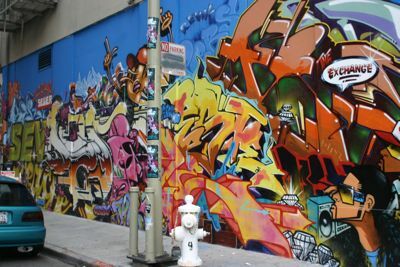 This raw, colorful, expressive and HUGE piece is located just a few blocks (east I think) of the Moscone Center in SF, just up from Howard Street. I can't imagine working this large!